Initially taught by his uncle in Delft, Willem van Aelst joined the Delft painter’s guild in 1643 before working in France . He served as the court painter in Florence to the Grand Duke of Tuscany, Ferdinando II de’ Medici. While in Italy, he encountered other Dutch naturalist painters who may have influenced the development of Van Aelst’s detailed style. 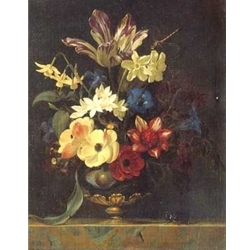 In 1657, he settled in Amsterdam and painted his famous still-life paintings that depicted glassware, silver, fruit, and flowers much like the work of Willem Kalf.